Boston Weather in February: Snow or Sun? Boston weather in February may still bring snow - but days are getting longer, you can expect plenty of days when the sky is blue and cloudless, and spring is almost in sight. 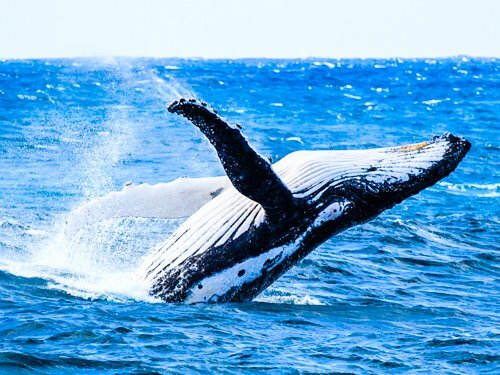 Unpredictable February weather means Boston hotels continue to offer excellent deals - but they start going up in March, so visit while they're still low! Many hotels offer attractive Valentine's Day packages for the entire month of February. If you live outside of the Northeast and are planning a trip to visit some of Boston's many university and colleges, February is an ideal time to find out if you'll like our climate. 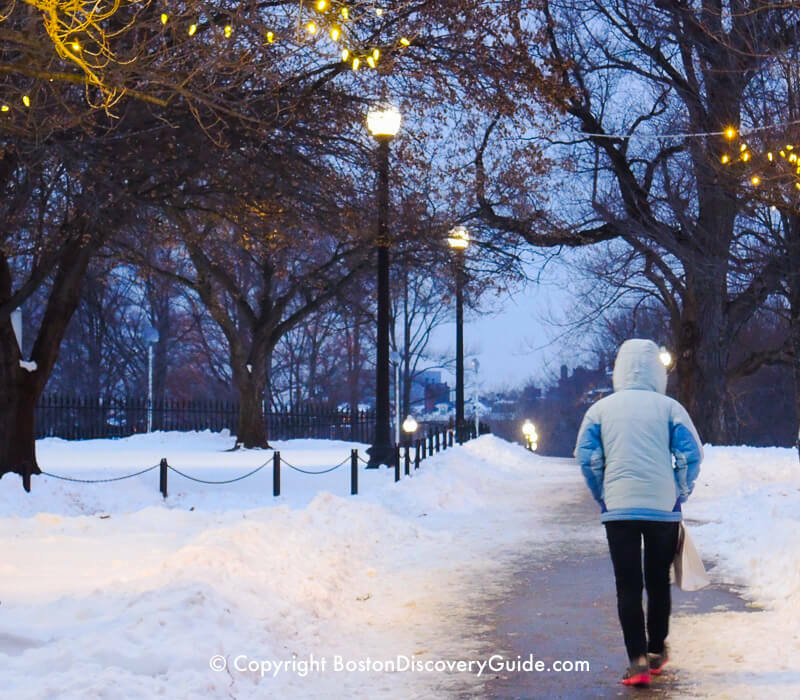 Just remember - February can be Boston's snowiest month - so check the weather forecast before you come, and bring extra warm clothing if the temperature looks like it will dip below freezing. February weather in Boston, as you can see in the photos throughout this article, can involve lots of snow, plenty of sun, and sometimes no snow at all. It's unpredictable. You should expect many days to feel cold, a few to be frigid if the wind is blowing, and then the best February weather of all: a few sunny days when you'll not exactly warm, but barely chilly. February is not typically the coldest month (January holds that honor), but don't expect any hints of spring. The photos on this page show you the range of what February Boston weather can look like. As you'll notice, you can see anywhere from a little to a lot of snow in all of them. However, because the temperature does rise above freezing fairly often during daytime hours, paths and even much of the ground can become clear of snow - at least for short periods of time. Days become longer in February, and the light is brighter. When daytime temperature stay above freezing, you'll be comfortable walking around with only a medium-weight jacket. Although most trees lose their leaves in November or early December, oaks retain theirs the longest - typically until early March, unless heavy snow storms and high winds knock them off. Weeping willows around the lagoon in the Public Garden and near the Esplanade stay golden through the winter. By February, you'll feel you're seeing color in the landscape again. February weather in Boston differs every year. In general, though, you should expect a mix of cold weather and at least some sunny days. Especially if you plan to drive, you should familiarize yourself with extreme Boston weather weather conditions and what to do if you encounter them. 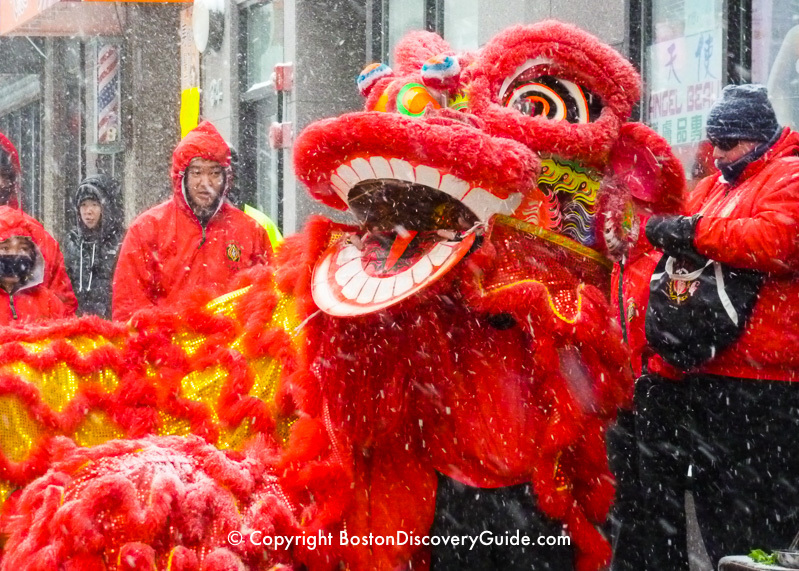 The big Chinese New Year Parade in Chinatown takes place outside during February in most years, and often coincides with cold (or snowy) weather. The parade and other festivities such as martial arts demonstrations last for hours, so dress warmly! Or join other spectators in Chinatown's wonderful Asian restaurants. Most Valentine Day events take place indoors - but this is a good time to take advantage of low winter hotel rates and book a room (look for Valentine's Day specials) so that you don't have to drive home in possibly bad weather conditions. If the Weather Turns Frigid, Snowy, or Rainy . 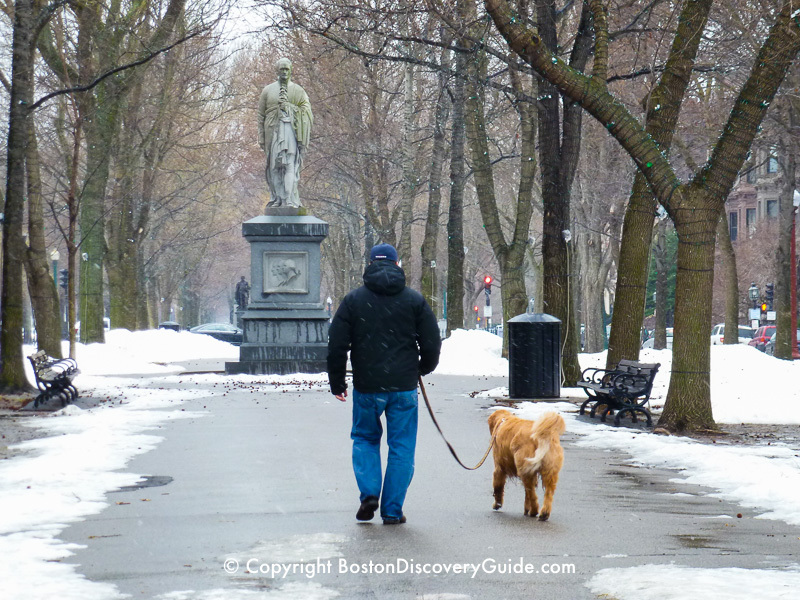 . .
To prepare for Boston weather in February, you should bring a warm jacket and boots, especially if you're planning outdoor activities. You should also pack gloves, a scarf, and a hat - you'll need them if the weather is cold and snowy. You'll be happy to wear well-insulated boots if we have a snow storm and you're walking around outdoors. There's also a chance of rain or even sleet this month - so check the current Boston weather forecast before you come to determine if you should pack an umbrella. Because February weather in Boston can occasionally be warm, you may also want to pack a couple of sweaters or hoodies to layer - or not. If you arrive in Boston and discover you have not brought the right clothes, head to Washington Street in Downtown Crossing for emergency shopping. 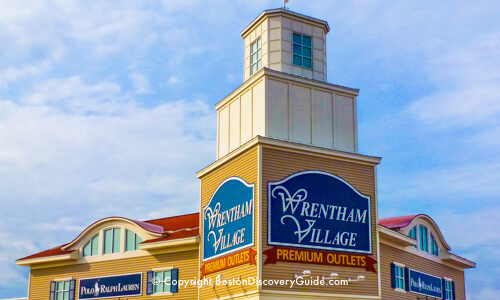 Within a 2-3 block stretch, you'll find a huge Macy's, TJMaxx, Eddie Bauer Outlet, DSW (shoes), and a number of other reasonably priced stores. If you want even more variety at (usually) a higher price point, continue along Washington Street to Faneuil Marketplace. 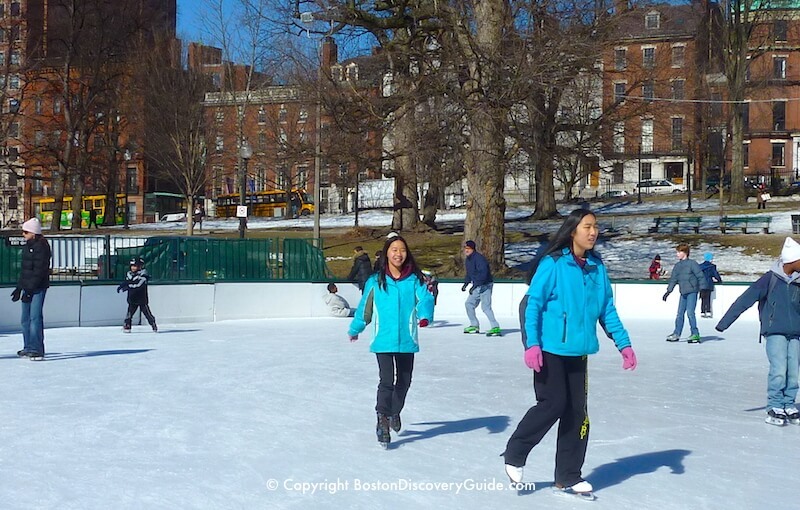 Cold Boston weather in February makes indoor activities very attractive - theaters, sports, and museums rank high on lists of popular things to do, along with shopping. 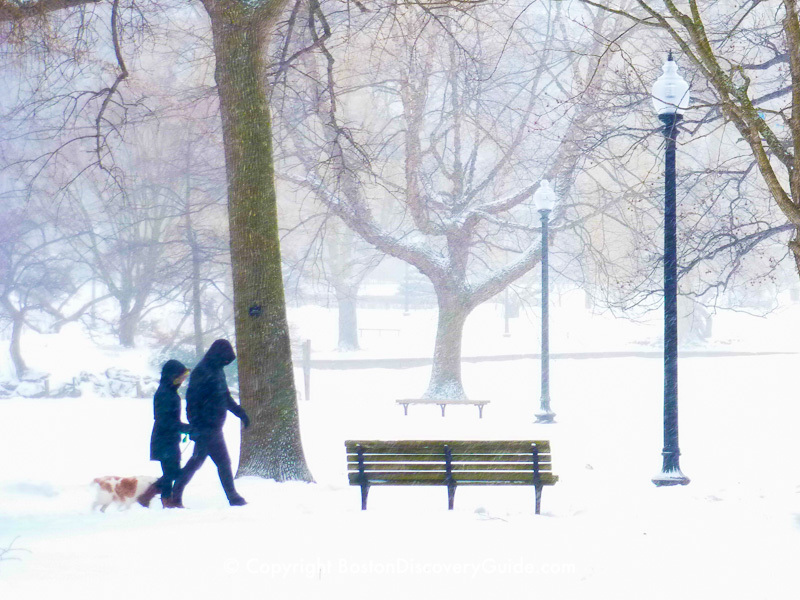 But to enjoy Boston to the fullest, dress warmly and head outside. 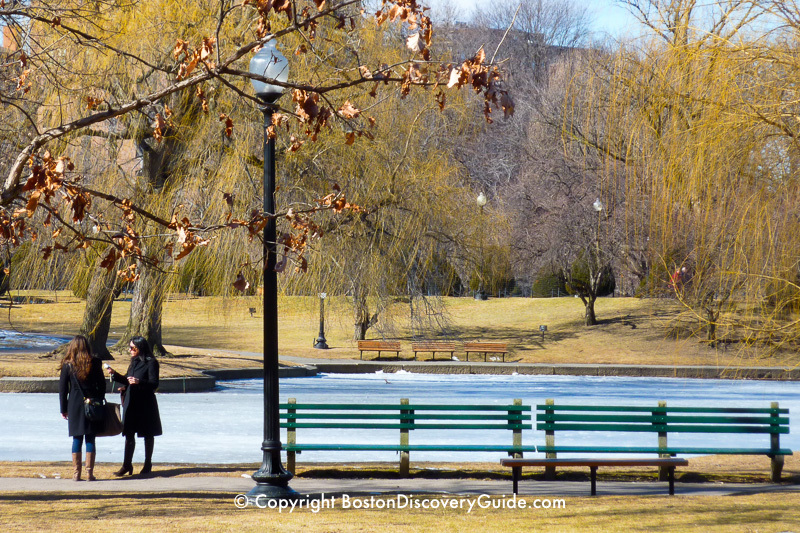 Walk around the Public Garden and Boston Common for scenic views. 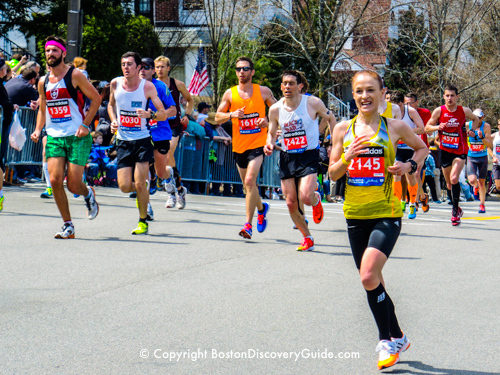 If you want to get a full experience of Boston, go on a sightseeing tour. Hop-on hop-off trolleys are especially popular because you can get off and on any time you please, so if you get cold, you just get back on to the (heated) trolley and ride for awhile. What does Boston look like during this last month of real winter? These photos will give you an idea of how Boston can look in February. Another good excuse for getting outside is ice skating. February is an especially good month for it because daytime temperatures are often above freezing. As long as you're moving around, you may be comfortable wearing just a sweater or lightweight jacket. With no leaves on the trees, you'll also have the chance to enjoy less-obstructed views of Boston's historic mansions. 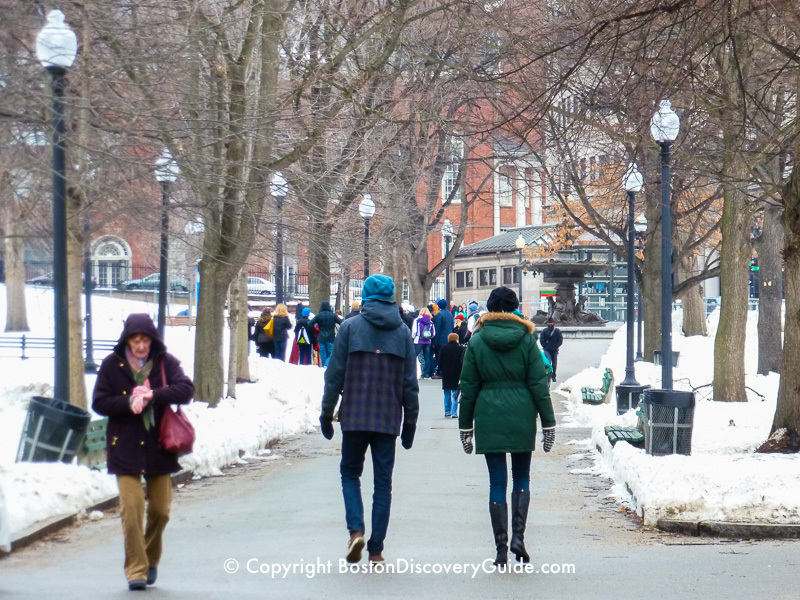 Boston Common is the starting point for many Freedom Trail walking tours - another good way to see the city during February, especially as many of them end up at Faneuil Marketplace, where you can enjoy the restaurants or walk over to the nearby historic taverns on and near Union Street.